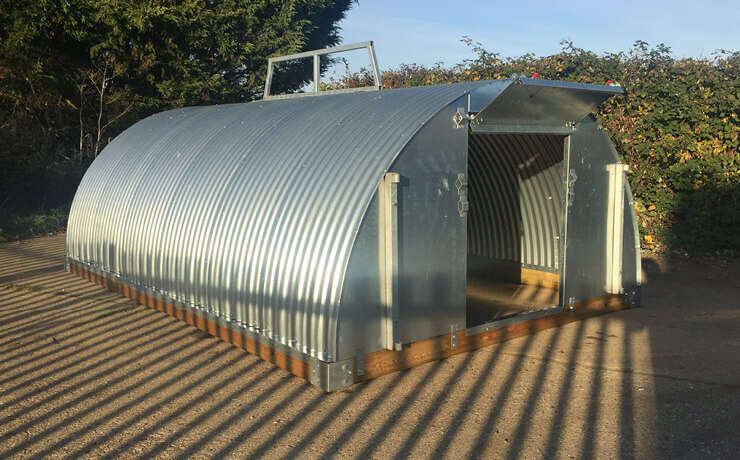 A development of our Sow Huts, Grower Huts are designed to provide a lower-cost alternative to our purpose-built Grower Units. Complemented by a range of feeding and watering options, plus hurdles, Grower Huts offer great versatility and outstanding value for money. 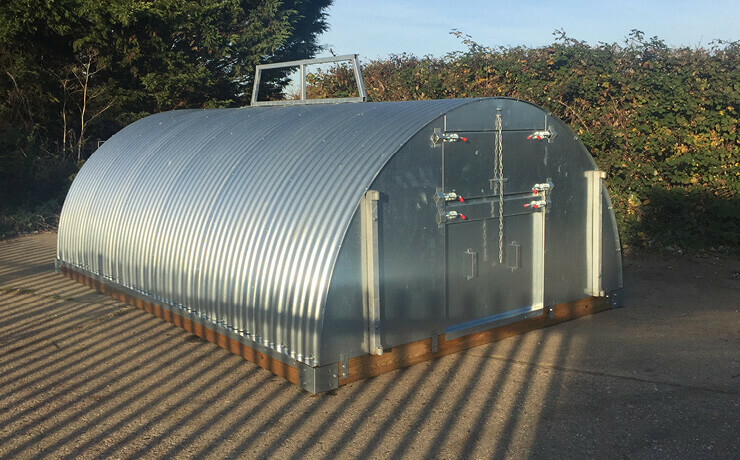 Our Grower Huts are built on a tough timber subframe and constructed from fully galvanised, heavy-duty steel to resist corrosion for long life and low maintenance. 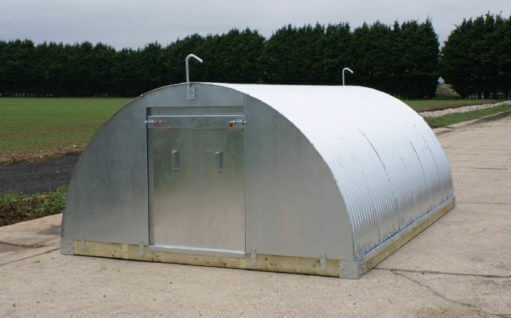 All Grower Huts have doorways 1.0m wide and 1.3m high at each end, with a 0.43m hinge-up door to provide controllable ventilation: the back door lifts out completely for maximum airflow. 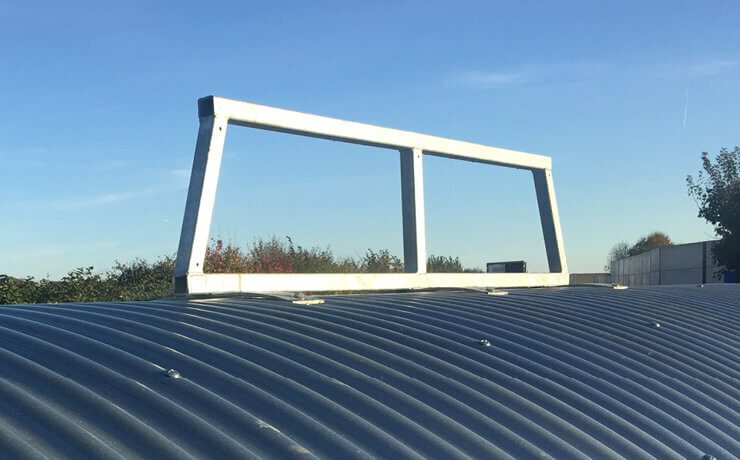 Unlike our Grower Units, they’re not fully insulated: however, an insulated roof fitted as standard helps to reduce condensation, keeping bedding drier and cutting straw usage and costs. 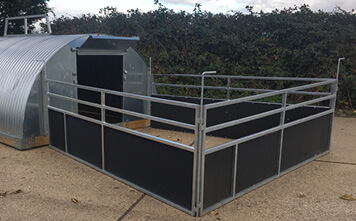 Grower Huts are supplied with an external lifting frame for easy moving, and attachment points for our Grower Hurdles. 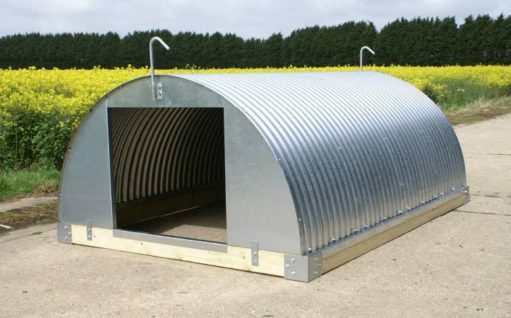 When you’re using Grower Huts, you can choose to feed your pigs outside in the hurdle run, or inside the Grower Hut. We supply feeders to suit your system and requirements, with a range of capacities and feed spaces to match your group numbers. This feeder is the same as the model fitted to our flagship Grower Units. Made from heavy-duty plastic and mounted on the rear of the Grower Hut for easy filling from the outside, it holds around 200kg of feed. Inside are nine feed spaces, with a step in front to allow easier access for younger pigs. 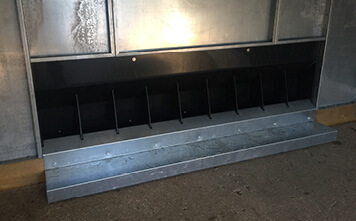 We offer two Ad-lib Feeders for feeding pigs outside in the hurdle run. 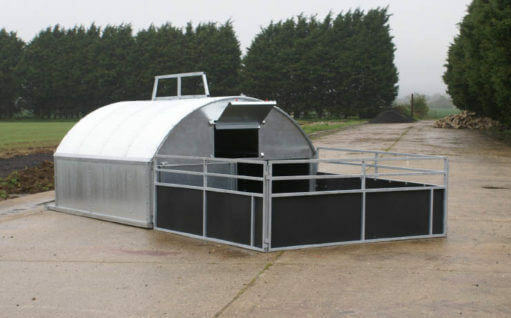 The smaller model is 1.2m wide with eight feeding spaces each aside, and a capacity of 450kg. For bigger groups, you can choose the 2.4m wide, 16-space version, which holds 900kg. Our Ad-lib Feeders are completely water- and vermin-proof, with each feed space covered with a hinged flap. All are made from galvanised steel for maximum strength and corrosion resistance, ensuing a long, trouble-free service life. A full-width hinged lid offers easy access for filling, while integral skids in the base with fork sockets and towing eyes makes moving simple, too. As weaning pigs become larger and more active, keeping their drinking water clean becomes an increasing challenge. We’ve developed our Grower Water products to ensure your animals always have access to fresh water, which is crucial for efficient feed conversion as well as basic welfare. 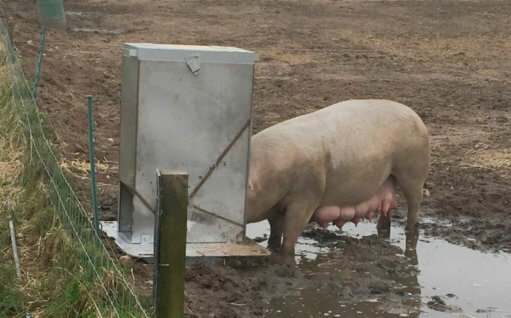 When they’re first weaned, young pigs generally find it easier and more natural to drink from a trough than from bite drinkers. 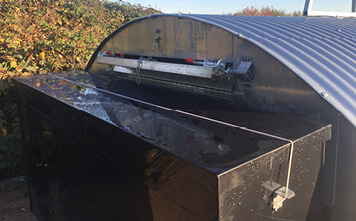 Constructed in galvanized steel, our Revolving Water Trough is set on revolving mounts, so you can simply invert it to empty out dirty water as required. The rounded profile means it fills quickly, and requires less water to fill. 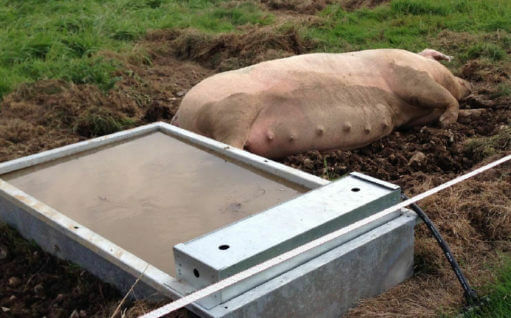 Dividing bars prevent pigs from climbing into the trough and fouling the water. The Weaner Revolving Water Trough is available in a range of lengths, so you can allow sufficient shoulder space according to the your group numbers. Although it’s less natural than drinking from a trough, weaning pigs soon get the hang of using bite drinkers, which offer the best guarantee of clean, fresh water at all times. 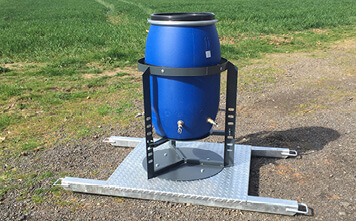 Our Barrel Drinker comprises a sealed plastic barrel that holds 220 litres: it’s mains-fed, so you don’t need to refill it manually, while the substantial head of water provides the necessary gravity feed to the bite drinkers and ensures the pigs never go thirsty. Supplied with nine bite drinkers as standard. 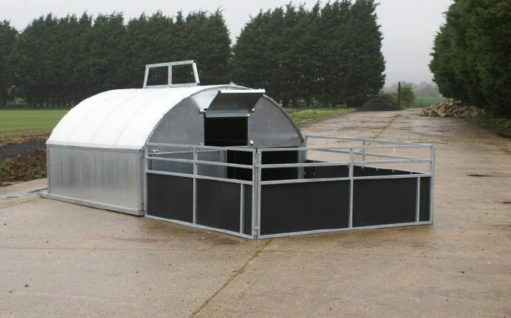 We supply our Grower Hurdles as an option to complement our Grower Huts. 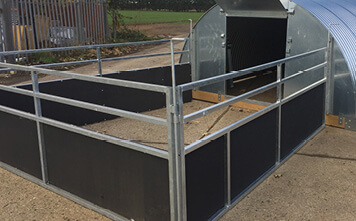 These hurdles make it easy to create safe, secure outdoor runs, and add more hurdles to increase the space as the pigs grow. Each Grower Hurdle measures approximately 3.0m long by 1.0m high. They’re made from galvanized steel, with the lower 0.6m clad in Stokbord, a tough, non-toxic recycled plastic: unlike plywood, it never needs painting or treating, and is both chew resistant and rotproof. 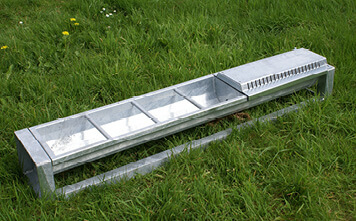 The hurdles fit together easily using galvanised steel pins. For maximum versatility, we recommend a set of five Grower Hurdles for each Grower Hut.